We got on the bus a little after 5am. It plowed out of town and followed a rough dirt road for about an hour. The darkness was made more intense by the low clouds that surround this incredible volcanic landscape. The morning light seeped though the misty morning. Clouds obscured most of the surrounding mountains but we got an occasional glimpse of the top of a-not-so distant volcano. They sure reach up into the sky. The bus arrived at the end of its route after the hour ride and we walked the rest of the way, about an hour up to the village. 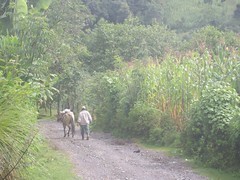 We saw only a handful of people in the early dawn: a few children running along the road heading to school or running away from these strange gringos, several men walking to work with various field tools and even a mule strolled down the muddy road fully loaded without an owner in sight. We enjoyed the trek up through the hills, way above the village of Salquil. I especially enjoyed the quiet stillness of the wet, lush green terrain. We only had a name for the group leader and weren't sure if she'd been contacted by phone. We finally found Juana´s house in San Francisco Javier. Her new concrete block house stood out amongst the neighboring tile- roofed adobe homes. Chickens wandered everywhere, the pig was tied out front and the multiple dogs checked us out to see if we had any food. Though we where unannounced, due to cell coverage being out, they got two chairs for us, and served us coffee and rolls out on the front porch. 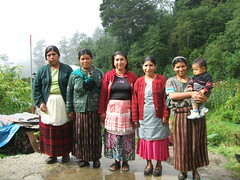 Juana scrambled to get the women together so we could interview them and take their photos. The women were quiet and reserved – normal for the first few minutes, but this was different. After 15 minutes we could not get them to open up, so we started the interviews. They grew potatoes, raised animals for sale such as cows and goats. When we asked them about the upcoming loan, they told us they were discontinuing the program. When we asked why, they said they had raised enough money and grew their businesses to a point they no longer need the micro-loans. At this point Randy and I looked at each other and realized that there was no reason to continue the interviews. The purpose for our visit was to help raise the funding for their next loan. There was not going to be a next loan, at least not for now. Of course we were glad they'd had such success, but it wasn't turning out the way we expected! At this point we decided to take a group photo and head back to Nebaj, another two hour voyage down the rutted roads in the northern part of Guatemala. The walk through the hills was as beautiful as the hike up. Just about every man stopped to shake our hands and say have a nice travel. The young children either yelled "gringo" from the safety of their mothers' skirts or ran to find those skirts. And the women smiled at us as they continued their walk with a basket of corn or bread or tamales balanced on their heads and a baby slung on their backs. We caught a microbus at the crossing of two dirt roads and piled in with the 20 other passengers. We arrived back to the hotel at about 1:00 and had a nice afternoon map. We had learned an important thing. Next time we will try to ascertain in advance whether the group plans to continue. If the answer is no, then we will find another group of women to interview. Of course, in this case we never could have known. And what a delightful morning it was!